Picture taken during one of the evenings we spent enjoying a romantic sunset over George Lake in Killarney Provincial Park, Ontario, Canada. out over George Lake at Sunset. 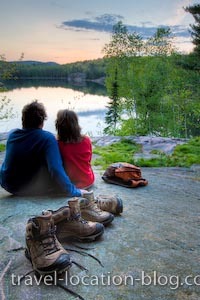 Besides the nasty biting flies, Rolf and I enjoyed our evenings at Killarney Provincial Park by watching the sun set over George Lake. The weather had been perfect - still fresh but the days were sunny so the evenings were spectacular! With George Lake looking more like a mill pond, the sunset reflections on its surface were outstanding especially fringed by the lush forest and prominent rocky outcrops along the lake's shoreline.